Day three proved tricky to sum up with only one blog post, so here is part two of my third day in Kazakhstan. If you missed part one, a) you are forgiven, and b) click on the link below to catch up. Following the Mausoleum of Khoja Ahmed Yasawi, our exploration of southern Kazakhstan continued with a visit to the Arystan Bab Mausoleum. It is a much smaller, and newer, building than the Mausoleum of Khoja Ahmed Yasawi, having been rebuilt numerous times, due to flooding and earthquakes, since its original construction in the 14th century. Most of the current building is only around 100 years old, although there are elements inside that are significantly older, including a pair of wooden pillars dating back several hundred years. 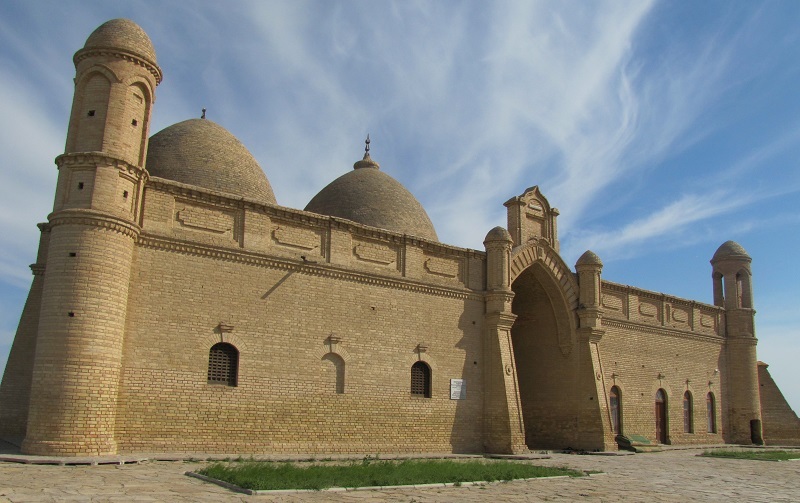 It is said that Arystan Bab was in fact the teacher of Khoja Ahmed Yasawi, and legend suggests that this mausoleum was built in order for Emir Timur to find success in his efforts to create a mausoleum for Khoja Ahmed Yassawi. Having spent 30 minutes at the site, including viewing the tomb of Arystan Bab and his students itself, we moved on, heading for Otrar. 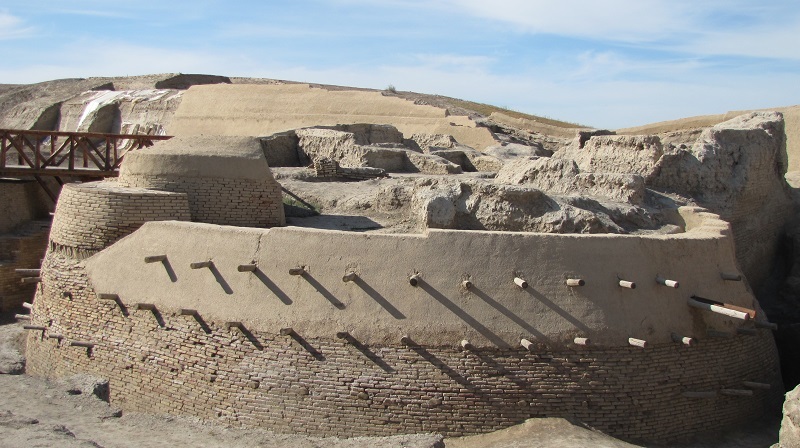 Otrar was an ancient Silk Route fortress and city, much like part ones Sauran, which was destroyed by Genghis Khan’s troops in 1219. Eventually it regained its status as a key stop on the Silk Route, but unfortunately, as with Sauran, it was slowly abandoned for other settlements before being reclaimed by the surrounding countryside and wildlife. Otrar is very similar to Sauran, and of the two, my preference is definitely Sauran. I cannot explain to you why, sometimes you just like the ‘feel’ of a place, and I liked the ‘feel’ of Sauran. Otrar is certainly the more active though, archeologically speaking; with numerous excavations ongoing, including of what are believed to be bath houses. Even if my preference lies elsewhere, this does not diminish the view and the incredible history that lies there. Our last stop for the day was a surprise trip to Ak-Mechet Cave, quite some way off what seemed to be the beaten path, at the suggestion of our driver. In fact, it is so far off of the beaten path that if you Google Ak-Mechet Cave, you will find practically nothing. Currently, two of the three top results are a blog and photos by a member of my tour party. On the winding drive to the cave I think I feared for my life like I never have before in a vehicle. I think the whole group felt the same! Our driver was, admirably, doing his best to get us to the cave before sunset, and so was channelling the spirit of any number of Formula 1 drivers; the last thing that you would want in a minibus that was almost certainly not designed to go around corners at more than 10 miles per hour, let alone 25! The hair-raising drive was worth it though. 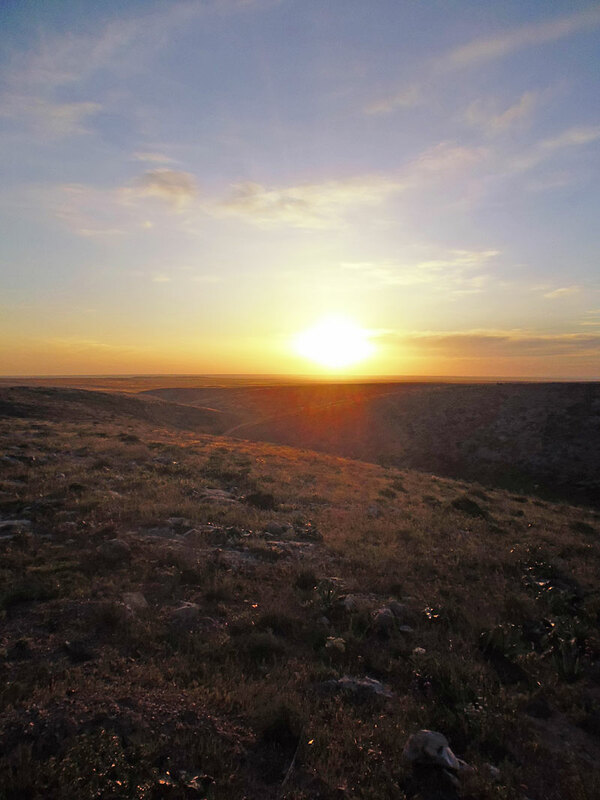 The views from our parking place on a hill overlooking the steppe were stunning, and the cave itself was something else. For someone with a fear of heights, descending the stairway into the cave was horrible. I am sure the stairway is perfectly safe, but I felt like it could come away from its moorings at any time. It even had a slight inward tilt. If you ever go, do not make the mistake I did and hold onto the handrail. 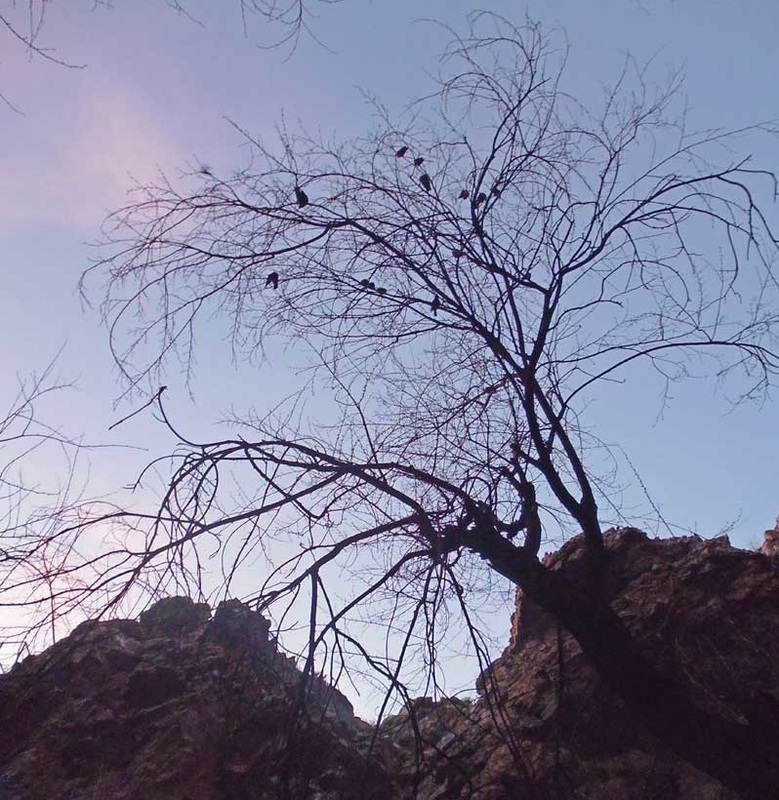 The cave is home to many bats and birds, something that adds enormously to its atmosphere, but also adds plenty to the grime covering the stairway. Once inside, Ak-Mechet Cave is incredible. It is considered to be a spiritual place, and so you will find stones piled up by Shamans for the spirits that reside within, and it is said that if you walk around the small mound inside and find a place to sit in silence that you can ‘feel’, and ‘connect’ with, the spirits and energy of the cave. Now, I am not someone who generally believes in spirituality and mysticism, outside of fiction anyway, but I will admit, the cave did have a certain undefinable something. Between the cawing, tweeting and chittering of the bats and birds, the drip-drip of water from the caves ceiling, the setting sun pouring through the cave entrance and the stillness inside, it was a unique experience. I have added a photo here (my digital camera did not deal with the dark very well) but it does not begin to capture the experience. If you are ever nearby I would highly recommend taking the road less travelled to visit the cave. We had little time to see Shymkent on our arrival, as we went straight for a late supper of bishbarmak (a Kazakh dish I will tell you more about another time), before a short drive to our hotel ready for bed. From what I did see, it seemed like a city that was flourishing, with many new developments and an active nightlife. I will add a little about our hotel before I finish, though, as a ‘heads up’ for anyone planning to visit Kazakhstan in the future. The hotels in Kazakhstan do have star ratings, but do not expect them to match up to what you may have experienced elsewhere. We stayed at what was, optimistically, called a ‘four star’ hotel. I may be no hotel expert, but it wasn’t what I would ordinarily expect a four star hotel to be. I think two stars may have been more accurate. I had to smile, though, when I went to plug in the bedside lamp in my room, only to find that there was not actually a plug socket in which to plug it in. The nearest one was across the room, in use by the air conditioning. I can only surmise it was there as decoration, though a vase of flowers would have been just as functional given the circumstances, and much more pleasant to look at. Check back soon for day four, in which we failed to find a 15km long, 500 metre deep canyon that was sat right under our noses. This entry was posted in Kazakhstan and tagged Ak-Mechet Cave, Arystan Bab Mausoleum, Bishbarmak, Cave, Hotels, Kazakh, Kazakhstan, Shymkent, Tourism, Travel. Bookmark the permalink.